Description: Sparingly branched tree to 30 m high, glabrescent. 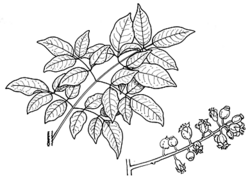 Leaves usually 2-pinnate (except for some on flowering shoots only 1-pinnate and with 5–9 leaflets), up to 100 cm long, secondary rachises to 12 cm long, commonly subtended by leaflets; petiole circular in cross section; leaflets with branched hairs when young, ovate to elliptic, mostly 5–12 cm long, mostly 3–6.5 cm wide, apex acuminate, base ± rounded, margins entire; aromatic when crushed. Inflorescence a terminal panicle, branching 1–3 times, with a grey indumentum, flowers solitary and arranged racemosely along inflorescence branches. Calyx an undulate rim. Petals purple-black. Ovary 2-locular. Fruit globose, 5–6 mm long, purple-black when ripe. Distribution and occurrence: Grows in a range of habitats, often in rainforests, vine thickets, and swales of coastal dune systems; north from Jervis Bay. Sometimes cultivated as an ornamental. Crushed fresh leaflets with an odour of celery, thus the common name Celery Wood.